*We recommend opening the linked forms in Internet Explorer for proper viewing. As stated back in April of this year, the IRS will begin enforcement of the Affordable Care Act (ACA) any day now. They have now published a draft of the soon to be sent Employer Shared Responsibility Payment (aka “Penalty”) notification letter. While some employers have received “non-filing” letters from the IRS already, this letter will be the first notification of employer penalties associated with not complying with the requirements of the Affordable Care Act. In addition, the IRS has updated questions 55-58 in the “Questions and Answers on Employer Shared Responsibility Provisions Under the Affordable Care Act” on IRS.gov (details below). Question 58 clearly identifies that penalty notifications for the 2015 calendar year reporting will be sent by the end of 2017. This will be a wake-up call to many in the industry that have been lulled into complacency as a result of the noise in the news over the last few months. This Q&A section also outlines the process employers can use to appeal any assessment levied on the organization. Employers will want to ensure they have their data organized in a way that will allow them to respond to these in a timely fashion as they will typically only have 30 days to respond. Additionally, it will be important for employers to leverage their relationships with their attorney familiar with employer ACA compliance as well as their partners providing ACA reporting services and ACA-related. Make sure that your organization is protected from these penalties. Integrity Data can help you comply with these ACA reporting requirements in a way that is easy, comprehensive and affordable while ensuring that the software remains continuously updated with any possible future changes made to the reporting mandate. Do you need help understanding ACA requirements or getting started with compliance? Learn more by signing up for our free webinar or contact us at sales@integrity-data.com or at (888) 786-6162. The general procedures the IRS will use to propose and assess the employer shared responsibility payment are described in Letter 226J. 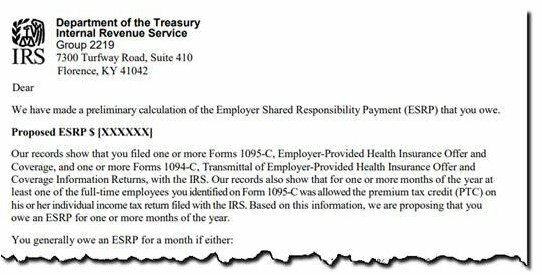 The IRS plans to issue Letter 226J to an ALE if it determines that, for at least one month in the year, one or more of the ALEs full-time employees was enrolled in a qualified health plan for which a premium tax credit was allowed (and the ALE did not qualify for an affordability safe harbor or other relief for the employee). If the ALE responds to Letter 226J, the IRS will acknowledge the ALEs response to Letter 226J with an appropriate version of Letter 227 (a series of five different letters that, in general, acknowledge the ALEs response to Letter 226J and describe further actions the ALE may need to take). If, after receipt of Letter 227, the ALE disagrees with the proposed or revised employer shared responsibility payment, the ALE may request a pre-assessment conference with the IRS Office of Appeals. The ALE should follow the instructions provided in Letter 227 and Publication 5, Your Appeal Rights and How To Prepare a Protest if You Don’t Agree, for requesting a conference with the IRS Office of Appeals. A conference should be requested in writing by the response date shown on Letter 227, which generally will be 30 days from the date of Letter 227.